Valdivia, located 854 km south of Santiago is the capital of the Region de Los Rios (Region of Rivers). Founded in 1552, it is the fourth city of Chile in order of antiquity. 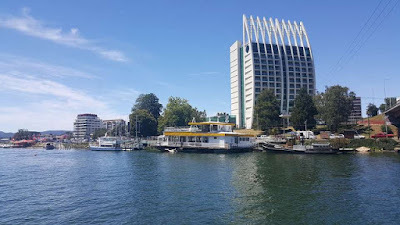 Its main feature are precisely the beautiful rivers that cross and surround it, not for nothing sometimes Valdivia has been compared to the city of Venice. Throughout this zone of Southern Chile, there is a great influence of the German colonization, in the architecture as well as in different areas of the production: agriculture, livestock, development of the dairy industry, brewery, sausages and cold cut meats, etc. This city, characterized by its tranquility and beautiful river landscapes, in May 1960 suffered the ravages of the greatest earthquake ever instrumentally recorded, of magnitude 9.5 on the Richter scale, with an approximate duration of 10 minutes. The mega-earthquake and subsequent Tsunami affected much of southern Chile and its effects were perceived in places as far away as Hawaii and Japan. However "The City of Rivers" stood up again and today is one of the most touristic of Chile, supported by its fascinating natural environment. In addition to tourism, the economic activity also shows a development in the areas of shipbuilding, cellulose, wood processing, brewing and food industry. In the heart of Arturo Prat Waterfront. The Municipal Market stands out for its solid architecture and active trade, here there are seafood, fruits, vegetables and local crafts. 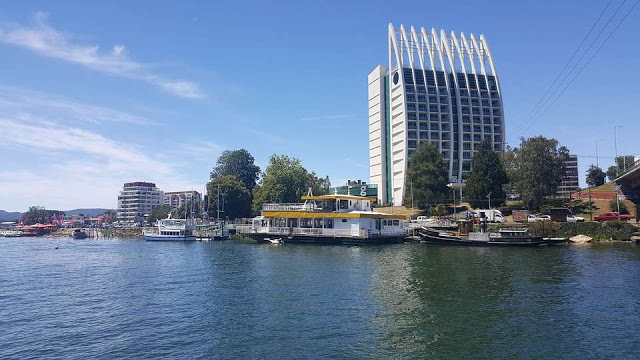 In front of the Mercado Municipal, bordering the river, is located the Feria Fluvial, these 2 markets, for the movement they represent and for the natural environment, are one of the main tourist attractions of Valdivia. Attractive protagonists of the surroundings are also the Sea Wolves, waiting expectantly that the merchants throw the leftovers for them to feed. Located on one side of the Feria Fluvial (River Market), this is an important place for trade and tourism because here arrive the boats bringing the seafood and agricultural products that are offered in the markets. Also from this terminal depart the tourism boats that make various excursions through the rivers of the region. 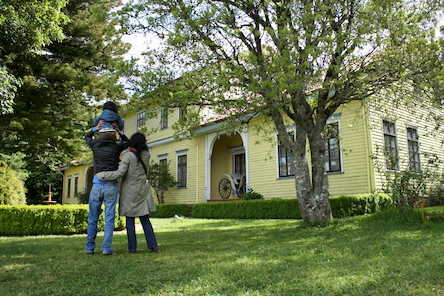 The Maurice van de Maele Historical and Anthropologic Museum, also known as Casa Carlos Anwandter, is a House- Museum located at Isla Teja, run by the Universidad Austral de Valdivia. The house was built by the German settler Karl Anwandter back in the 1860s. Founded in 1956, the museum's name remembers to the Belgian university teacher who dedicated long decades to the protection of the regional heritage. In October 1981, it was declared a National Historic Monument. The tour through its valuable collections allows to know the history of a society from 12,000 years ago to the modern era, including the Hispanic presence from the time of the Conquistadors to the post-independence of Chile and all the influence of the German colonization since 1850. Located in the Campus of the main University of Valdivia at Teja Island. The Botanical Garden is a place of leisure for all nature lovers and outdoor laboratory for the University. With more than 950 species, its collections of living plants are arranged with scientific criteria, individually classified. Currently the Botanic Garden is in a master plan that will position it as a World-Class Park and great tourist attraction. Adjacent to the Botanic Garden of Isla Teja is located Parque Saval, nowadays the most important green, outdoor recreational area of the city. Here are held many massive events such as concerts and "La Fiesta de la Cerveza" (Valdivia's Beer Fest). The park has several attractions such as lagoons with Lotus flowers, a Rodeo "Half Moon", Playgrounds, Equestrian facility, recreational trails, "Quinchos" (grill and roast sheds), picnic areas, Canopy during the high season. Parque Oncol is a Private Nature Reserve belonging to the Arauco Forestry Company, a place privileged by nature located 28 Km. from Valdivia. The Reserve seeks to protect the Valdivian Temperate Rainforest, an ecosystem developed under very special geographic and climatic conditions, unique in Latin America and very rare to find a similar one in the rest of the planet. A wonderful excursion with trails, viewpoints and a route that ascends to the top of Oncol Hill, from where you can see the Pacific towards the W. and, if the weather is good, for the E. volcanoes of the Andes on the horizon. Located in the bay of Corral, 18 km from the city of Valdivia, was part of the system of forts of the city. The "Casa del Castellano", stone reconstruction from 1991-1992, houses the permanent exhibition, the fortification consisted of thick walls, castles and cannon artillery. Among other structures are also the ruins of the chapel, chaplain's house, warehouse and ammunitions dump. The Niebla Museum has become a tourist attraction and one of which has the largest number of visitors among the national museums. As a land of German pioneers, there are several small breweries, included in the local tourist circuits. A must- see in the city is the Kunstmann Brewery an the visit to the adjacent Beer Museum. The gallery shows the history of the brewing company, based on the German Beer Purity Law (Reinheitsgebot) of 1516, decreed by William IV Duke of Bavaria, and under the precepts of elaboration of Carl Anwandter, who founded the former Anwandter Brewery in 1851.